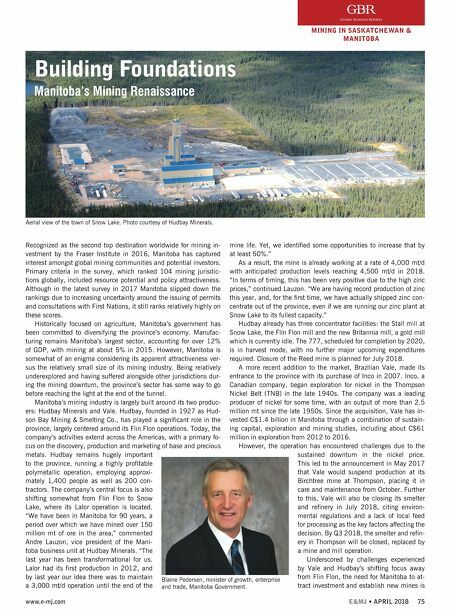 74 E&MJ • APRIL 2018 www.e-mj.com MINING IN SASKATCHEWAN & MANITOBA lies only 6 km from Cigar Lake, one of the world's great uranium mines. Alongside promising uranium projects, companies such as Gensource are gaining traction in other resource areas. Gensource plans to expand its potash operations in Sas- katchewan through a partnership with Essel Group Middle East, aimed at bringing one of its small-scale projects into production. The company is currently negotiating off- take agreements before moving into detailed engineering in order to erase risk and build attractiveness to consumers as they gain price stability. The potash solution mine is also very innovative in its technology. "It has a selective dissolution process which elimi- nates tailings on the surface," highlighted Jason Mewis, president & senior engineer and EngComp, which has set up an innovative multi- party contract for the delivery of this project between Gensource and the contractor, SECON. "Additionally, the small industrial facil- ity has such little environmental footprint that the company should only need to submit a project proposal to the Environmental Branch without conducting a full environmental impact assessment… The delivery model is expected to be disruptive and revolutionary for the potash industry." Taking advantage of a more attractive commodity cycle, Fo- ran Mining has been focused on its VMS deposit, McIlvenna Bay. The most significant recent development is an agreement that Fo- ran signed with Glencore Canada, a subsidiary of the mining gi- ant Glencore. Glencore has agreed to complete a feasibility study on McIlvenna Bay in return for obtaining the zinc offtake from the project. "As we advance development work on McIlvenna Bay, exploration activity will be driving the interest in the company," commented Patrick Soares, president and CEO at Foran Mining. "At US$3.20 copper US$1.45 to US$1.50 zinc and a Canadian dollar exchange rate at $0.78 McIlvenna Bay looks better than the PEA projections. With Glencore's long term view on zinc and copper prices, it is no wonder that they want to get the zinc offtake from McIlvenna Bay." In addition to McIlvenna Bay, Foran Min- ing has also made a discovery about 8 km away called the Thunder Zone, plus a large EM anomaly about 1 km away from McIl- venna Bay. Staying On Top With many promising projects underway, the challenge will be the attraction of investment towards their progression. The recent intro- duction of a Provincial Sales Tax (PST) on drilling costs could act as a deterrent, and the industry hopes that it will be revised. 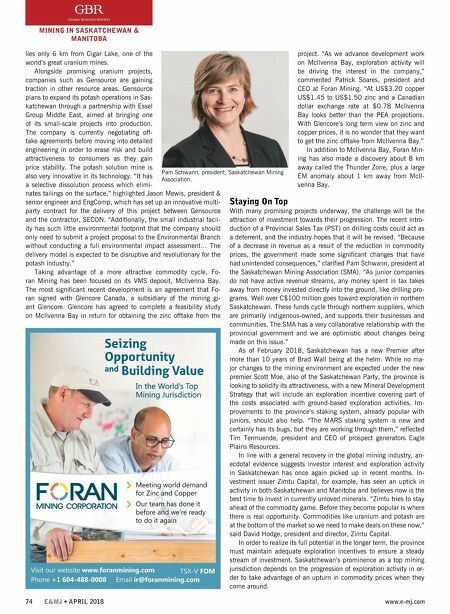 "Because of a decrease in revenue as a result of the reduction in commodity prices, the government made some significant changes that have had unintended consequences," clarified Pam Schwann, president at the Saskatchewan Mining Association (SMA). "As junior companies do not have active revenue streams, any money spent in tax takes away from money invested directly into the ground, like drilling pro- grams. Well over C$100 million goes toward exploration in northern Saskatchewan. These funds cycle through northern suppliers, which are primarily indigenous-owned, and supports their businesses and communities. The SMA has a very collaborative relationship with the provincial government and we are optimistic about changes being made on this issue." As of February 2018, Saskatchewan has a new Premier after more than 10 years of Brad Wall being at the helm. While no ma- jor changes to the mining environment are expected under the new premier Scott Moe, also of the Saskatchewan Party, the province is looking to solidify its attractiveness, with a new Mineral Development Strategy that will include an exploration incentive covering part of the costs associated with ground-based exploration activities. Im- provements to the province's staking system, already popular with juniors, should also help. "The MARS staking system is new and certainly has its bugs, but they are working through them," reflected Tim Termuende, president and CEO of prospect generators Eagle Plains Resources. In line with a general recovery in the global mining industry, an- ecdotal evidence suggests investor interest and exploration activity in Saskatchewan has once again picked up in recent months. In- vestment issuer Zimtu Capital, for example, has seen an uptick in activity in both Saskatchewan and Manitoba and believes now is the best time to invest in currently unloved minerals. "Zimtu tries to stay ahead of the commodity game. Before they become popular is where there is real opportunity. Commodities like uranium and potash are at the bottom of the market so we need to make deals on these now," said David Hodge, president and director, Zimtu Capital. In order to realize its full potential in the longer term, the province must maintain adequate exploration incentives to ensure a steady stream of investment. Saskatchewan's prominence as a top mining jurisdiction depends on the progression of exploration activity in or- der to take advantage of an upturn in commodity prices when they come around. Pam Schwann, president, Saskatchewan Mining Association.